Fairfield County Giving Day continued to grow with its fourth annual 24-hour period of fundraising activity, which included a number of Newtown nonprofits participating. 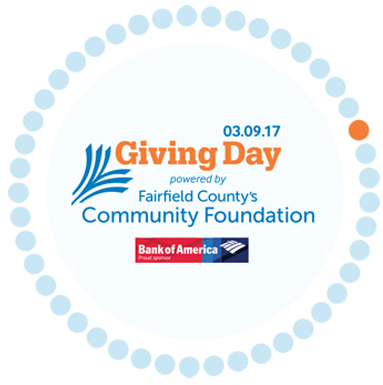 Fairfield County Giving Day continued to grow with its fourth annual 24-hour period of fundraising activity. The mission of the event is to raise as much money as possible for nonprofit organizations, done primarily through online donations. Groups are also eligible for a share of a $100,000 prize package, awarded before and during the 24-hour event for everything from a Facebook Photo Contest and most unique donors to power hours and most dollars raised. For the third straight year, the final total was a record-setting number. According to numbers posted online (naturally... ) by host organization Fairfield County's Community Foundation, the 2017 Day of Giving on March 9 raised $1,465,246 for 414 nonprofit organizations that serve residents of Fairfield County. That represents an increase of $218,282, or approximately 15 percent, over last year's record-setting total of $1.2-plus million. Donations need to be at least $10, with no maximum. Donors were allowed to contribute to any number of nonprofits they wishes to support. A total of 13,718 registered donors participated in last week's event, which explains how the day ended with 17,359 total gifts made. Eighteen Newtown-based organizations collected a total of $25,553, broken down as follows: The Animal Center, $2,901; Ben's Lighthouse, $3,261; The Catherine Violet Hubbard Animal Sanctuary, $2,906; EverWonder Children's Museum, $110; The Exceptional Partner Service Dogs, $430; Friends of Second Company Governors Horse Guard, $720; The Jesse Lewis Choose Love Movement, $400. Also, Kitten Associates, $3,735; LOF Adaptive Skiers, $625; Merryhill Child Care Center Inc, $150; The Newtown Foundation, $1,450; Newtown Parent Connection, $1,170; Newtown Scholarship Association, $3,400; Newtown Underwater Search And Rescue, $0; Newtown Youth & Family Services, $2,325; The Resiliency Center of Newtown, Inc, $35; Sandy Hook Promise Foundation, Inc, $645; Town Players of Newtown, Inc, $1,050; and Two Coyotes Wilderness School, $240. Strong showings were reported for first-time group Newtown Scholarship Association (NSA), as well as for returning participants The Animal Center, Ben's Lighthouse, The Catherine Violet Hubbard Animal Sanctuary, Kitten Associates, and NYFS, who all surpassed the $2,000 mark. NSA President Ted Kohler was pleased with the day's outcome, which was spearheaded by Margaret McCarthy and Becky Osborne. "This was something that we wanted to participate in, and they were instrumental in getting us involved," Mr Kohler said March 15 of the two NSA board members. Giving Day, he said, "was something that we have wanted to participate in. We know that the effort's been successful for a number of charities in the local area. "We have strong support in the community, so we wanted to try to leverage that platform and take advantage of that opportunity," Mr Kohler said. While NSA fell short of its self-appointed goal of $20,000 for its first Giving Day outing, the board is nevertheless pleased. "It was our first year participating, and it was successful in our eyes," Mr Kohler said. "Hopefully we'll learn from other charities that have been doing this for the last three or four years, and some of the strategies they use, to make our experience on Giving Day more profitable." NSA is already planning on participating again in Giving Day, he added. At the end of the 2017 campaign, Curtain Call repeated as the top performing Giving Day participant. For the fourth straight year, in fact, it was the Stamford-based theater company who emerged at the top of the fundraising pack. Its donations and cash prizes totaled $81,298. Second place went to Norwalk-based Family & Children's Agency, who earned $49,060, knocking Wildlife in Crisis - which had held that coveted spot for three years - into third place. While hundreds of nonprofits and charities across the region received a lot of support on Fairfield County Giving Day, the Newtown Salvation Army service unit did not benefit during its first Giving Day outing. The unit was reportedly shut out of receiving direct donations due to confusion over the process, according to representative Steve Bennett. The Newtown resident had been excited, he said prior to March 9, to be invited to participate in Giving Day. "We were asked if we wanted to participate, and told we didn't need to do anything, that set-up would be taken care of for us," Mr Bennett said March 15. The day before the Day of Giving, Mr Bennett went to the donation website to find the local service unit. He wanted to send out an e-mail to as many people as possible, he said, letting supporters know how they could donate the following day. "I noticed we weren't showing yet, but was reassured that we would appear as planned on March 9," Mr Bennett said. That never happened. Donors could find a single listing for The Salvation Army, but there was no way for anyone to denote which service unit they could donate to. "It was a little distressing," Mr Bennett said. "I was under the understanding that donors were supposed to be able to specify which chapter they wanted to donate to." At the end of Day of Giving, four donors offered a total of $4,765 to The Salvation Army. It is Mr Bennett's understanding now that the Salvation Army will be looking at the ZIP Codes of the four donors, and money will be distributed to the service units based on the address of the donors. "I didn't expect a great number of people to respond, but I did expect more than a few," said Mr Bennett, who said he did get "a good response from Salvation Army in terms of, after the fact, they were able to point out what happened." This year's misunderstanding will not stop the local service unit from trying again. "Now that I know what the correct instruction is," said Mr Bennett, "I can tell people to donate to the general Salvation Army listing, and their donor ZIP Code will get it to Newtown." Anyone who was unsuccessful trying to help the Newtown Salvation Army Unit who would like to support the cause may send a donation directly by mail. Checks made out to Salvation Army, Newtown Unit can be sent to Peg Forbell, Treasurer, 128 Walnut Tree Hill, Sandy Hook CT 06482.